Boys & Girls ages 5-6 by April 30 of season. School & Neighborhood Teams, Tee & Coach Pitch, Safety Ball, Bat Around, Uniforms, Emphasis on FUN & FUNdamentals. GREAT Trophies! Ages 7 & 8 by April 30. Coach pitch. A Reduced Injury Factor (RIF-5) ball is used. Ages 9-10 by April 30. First level kid pitch/draft. Ages 10-11 by April 30. Ages 11-12 by April 30. Tournaments. Ages 13-14 by April 30. Girls coach-pitch softball ages 7-8 by 12/31 of year prior to season. Girls fast-pitch softball, ages 9-10 by 12/31 of year prior to season. Girls fast-pitch softball, ages 10-11 by 12/31 of year prior to season. Girls fast-pitch softball ages 11-12 by 12/31 of year prior to season. Tournaments. Girls fast-pitch softball ages 13-14 by 12/31 of year prior to season. Tournaments. The Challenger division provides boys and girls with special needs the opportunity to play Little League Baseball. Each player in the Challenger League is partnered with a volunteer from Mira Costa High School or the Friendship Circle. These volunteers stay with their player out on the field and assist them throughout the game. 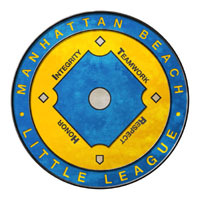 Participation in the Challenger League is free, with all costs for registration, uniforms, and equipment covered by Manhattan Beach Little League. Included only for scheduling purposes.